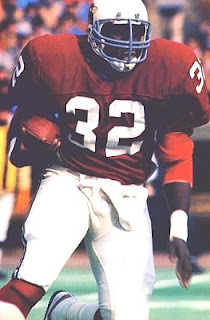 A record-setting runner in college, Anderson was taken by the Cardinals in the first round of the 1979 NFL draft (eighth overall). With breakaway speed to go with his size, he moved immediately into the starting lineup as a rookie with spectacular results. Cardinals went 5-11 to finish fifth in the NFC East while leading the NFC in rushing yards (2582). While the rookie rushing total remained his career high, Anderson continued to be a consistently outstanding runner and had over a thousand yards in five of his first six seasons (only missing in strike-shortened 1982). Injuries limited him to 479 yards in 1985 and he was traded to the New York Giants during the ’86 season. He saw little action as a reserve in 1987 and ’88 but moved back into the starting lineup at age 32 in 1989 and rushed for 1023 yards and 14 TDs. He had another solid year in ’90, gaining 784 yards, scoring 11 touchdowns, and gaining MVP honors in the Super Bowl. Anderson was a reserve again in 1991 and ’92, his last two seasons. Overall, he had six 1000-yard rushing totals and gained 10,273 yards, the eighth-ranked career total in NFL history at the time of his retirement. His 86 touchdowns (81 rushing, 5 receiving) ranked 18th. He also caught 376 passes for 3062 yards and was twice selected to the Pro Bowl.